Today, I am sharing a diy housewarming gift idea that I had not intended on doing. You see, I bought a gift on line. When it arrived the day of the housewarming party I was terribly disappointed in the actual size of it. It wasn’t cheap either, but I have to admit it was my own fault for not looking at the actual dimensions. 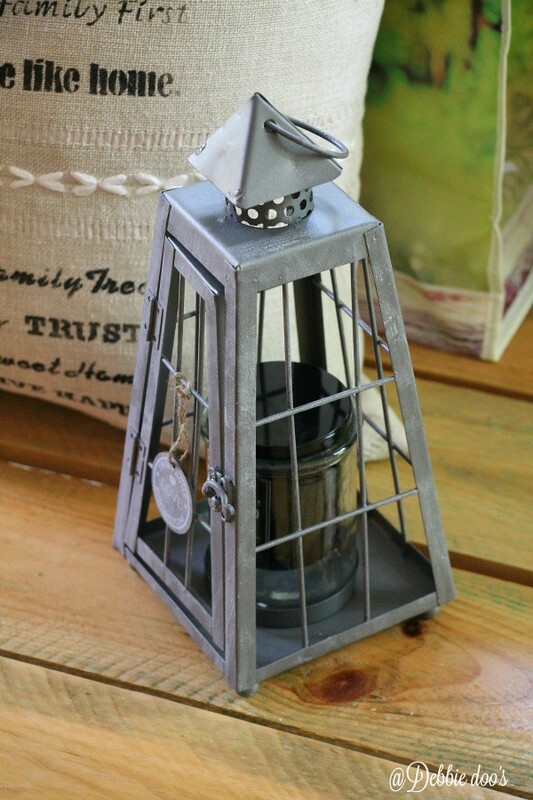 I was scouring the net for something industrial in style considering that is the couples personal style and when I ran across this lantern, I thought to myself this is it, it’s perfect. The lantern alone just didn’t seem like enough for this special couple and to celebrate their new home. Thankfully I had craft supplies on hand and came up with the perfect little extra something something. I had this home stencil for a few years ago. 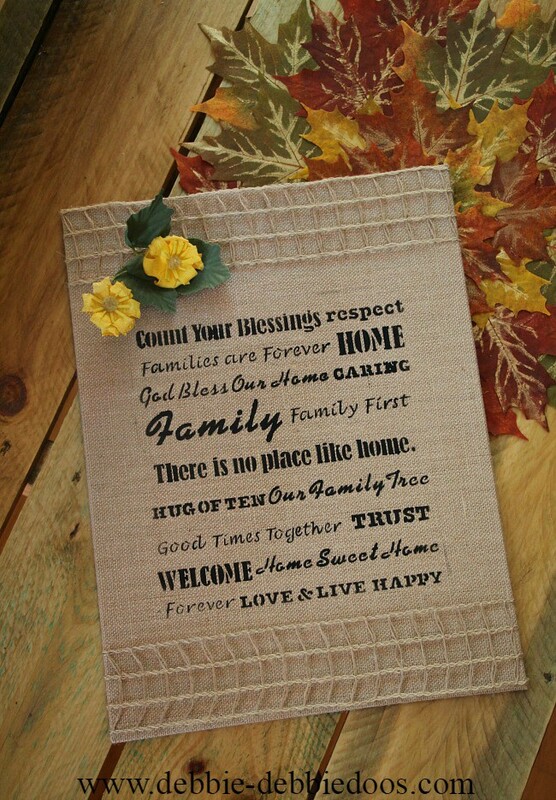 I had done some fall kitchen burlap art with it and I don’t believe I have used it again since. 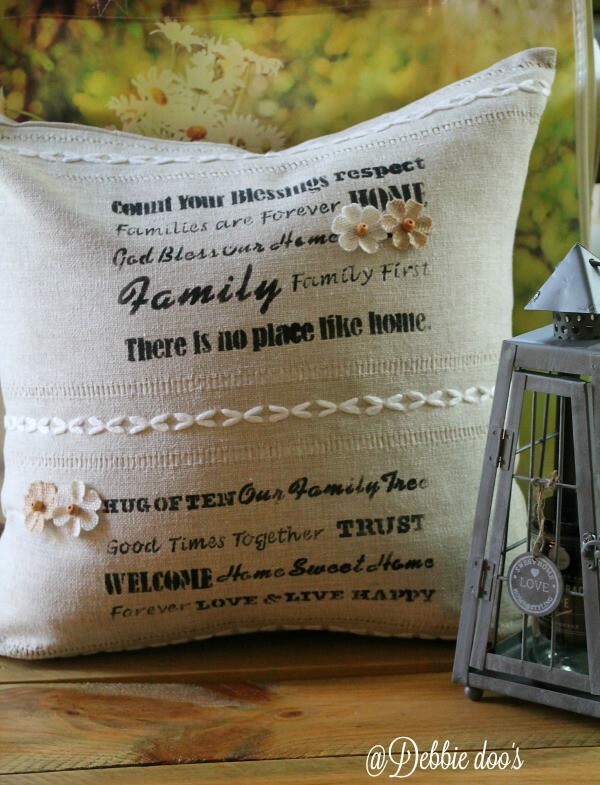 How appropriate though for a new home saying…and on a pillow. 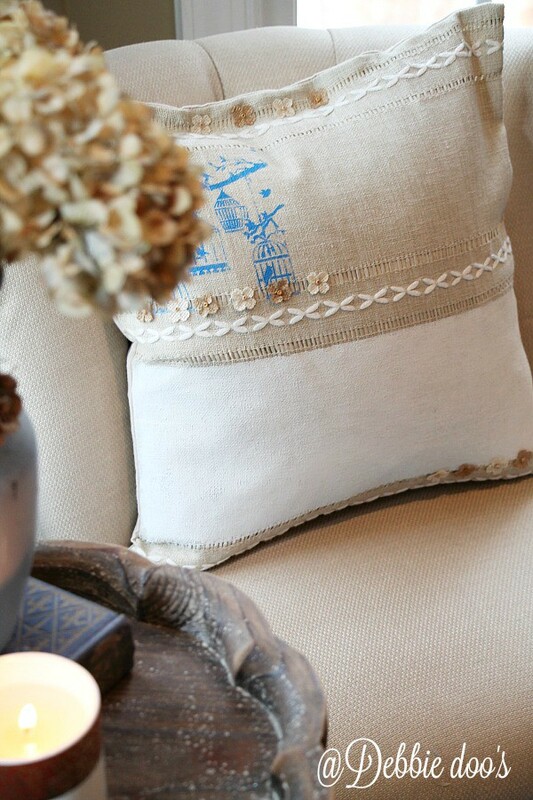 I added a few cute burlap flower embellishments and fortunately even had a pillow insert. Thrilled with the end result and I hope they enjoy it. Thanks for stopping in today for another craft recovery event! Always an event with me. If you are new here, welcome. I would love to see you back again. There is plenty more to see. I know I love it! Really cute .. It’s nice to go shopping at home.. Lol! I do.. In my basement… Always finding something down there. I’m sure they will love their gift? They did love it:) I was so happy I had that little extra. What a special gift. When something is homemade it has a part of you in it. Those are the gifts that mean the most. I just got a few stencils and can hardly wait to use them. Just beautiful. 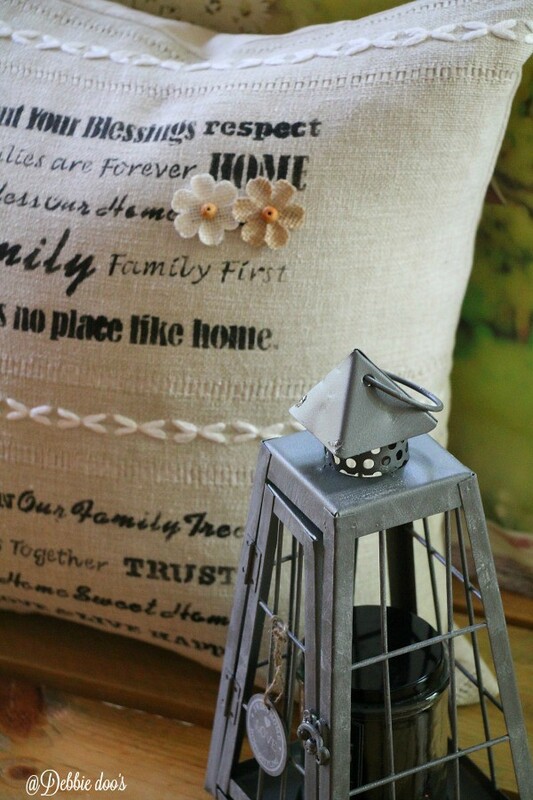 I bet your friends liked the pillow better than the lantern, just because it was something you made. I love how it turned out. I didn’t know you could get pillow covers from Hobby Lobby! Beautiful housewarming gift, and I think I need that for MY house! 🙂 Another great idea, Debbie, with beautiful results! Have a great day! Thanks Judy! I left the links for the pillows in the post. That is a great gift! I love it. I have to go online and find some of these items. Thanks for sharing. Yep, I leave all the links for the supplies. Thanks Doris. Love this pillow. 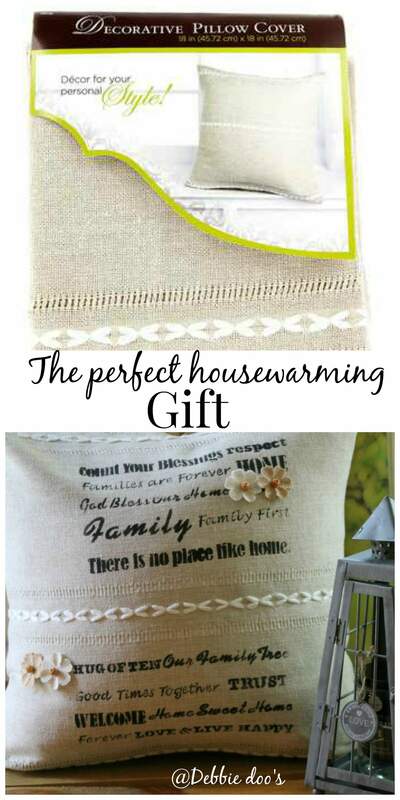 A perfect home warming gift. Yea! What a wonderful housewarming gift, Debbie! 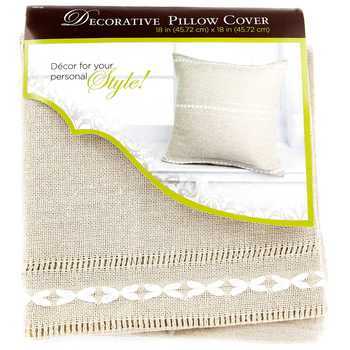 I had no idea HL had pillow covers like that. You’ve turned it into a lovely piece of home decor your friends will treasure. Thanks for the inspiration! It’s a lovely gift…I think they’ll love it! 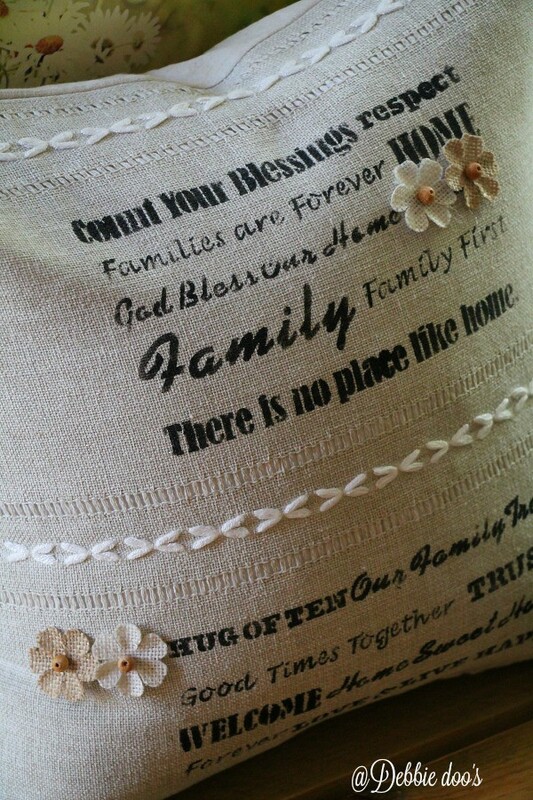 The pillow is cute and thoughtful, makes me think my friends were cheated. All they got was a hand painted toilet plunger with a note that said I hope they always have a pot to piss in. HAAAAAAAAAAAAAAAA!! That was an awesome gift Bliss.